An "urgent" inquiry has been demanded after a dummy bomb used in a security exercise caused a Premier League match at Old Trafford to be postponed. A controlled explosion was carried out on the device, which police said was accidentally left by a private firm. Greater Manchester Mayor and Police and Crime Commissioner Tony Lloyd called for a full inquiry into the "fiasco". He also told BBC Sport that United "need to apologise very, very seriously" to supporters of both clubs who were at Old Trafford. Bomb disposal experts were called to the 75,000-seat stadium on Sunday after the replica device was found in a toilet. The Premier League match has been rearranged for Tuesday at 20:00 BST and will be screened live by Sky Sports. Lloyd called the situation "unacceptable" and demanded an inquiry to discover "how this happened, why it happened and who will be held accountable". "And unnecessarily put people in danger." Security Search Management & Solutions Ltd (SSMS) was the firm hired by Deacons Canines to test its sniffer dogs using fake bombs, the BBC understands. Managing director Chris Reid said: "It is a very unfortunate situation and the consequences obviously were that a lot of people were inconvenienced. "Fortunately, everybody was fine which is the most important thing." The Premier League praised the way the incident was dealt with. A statement read: "We would like to thank Manchester United's staff, the police and other emergency services for all their efforts today as well as rearranging the match for this coming Tuesday. "Both Manchester United and AFC Bournemouth's management has been extremely helpful in reaching a swift resolution, which is the best possible given today's events." United will refund all tickets and allow ticket holders from both clubs to watch Tuesday's re-arranged game for free, while Manchester United season ticket holders will also be given a credit. It is a gesture that is estimated will cost United around £3m. Bournemouth, meanwhile, are offering free coach travel to the match for fans with a valid ticket. Club chairman Jeff Mostyn told BBC South Today: "They make sacrifices every single week and go to great expense travelling away." 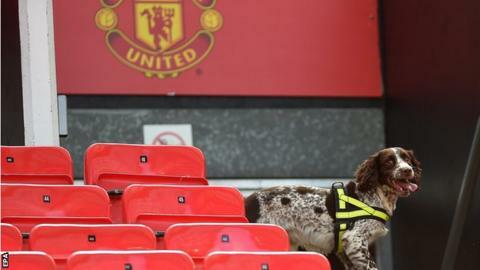 The Sir Alex Ferguson Stand and the Stretford End were evacuated and sniffer dogs brought in. Kick-off was delayed initially and shortly afterwards the match was abandoned on police advice. A Greater Manchester Police (GMP) statement read: "Shortly before today's planned football fixture, staff from the Manchester United ground alerted police to a suspicious item that had been found in the toilets within the North West Quadrant, between the Sir Alex Ferguson stand and the Stretford End. "Police quickly attended and explosive experts were called in to assess the item, which has been described as an incredibly realistic-looking explosive device." A bomb disposal team carried out the explosion at about 16:30 BST. Assistant chief constable John O'Hare said: "I am grateful to the Manchester United and Bournemouth supporters for their support and assistance today. Manchester United's executive vice-chairman Ed Woodward said: "The club takes security very seriously and staff are regularly trained with the police and emergency services to identify and deal with these incidents. Cherries chairman Mostyn said the incident had left the players "immensely disappointed and despondent". He added: "They had trained really hard throughout the week to play in one of the greatest sporting theatres in the world." Just under two hours before the controlled explosion was carried out, an "operation red code" alert was issued over the public address system. Fans were then advised that, because of the discovery of a suspect package in the north-west quadrant of the ground, the match was "abandoned" on police advice. Supporters who were still in the ground were advised to stay in their seats while the forecourt was cleared of fans who had been in the two evacuated stands. United players were seen leaving the ground shortly after 16:30 BST. BBC commentator Conor McNamara said he saw Bournemouth players and staff boarding their team bus outside Old Trafford around an hour later, before flying back to the south coast later. Manchester United had started the day with an outside chance of qualifying for next season's Champions League by finishing fourth in the Premier League. However, Manchester City's draw against Swansea in their final game means United are effectively out of the running. City are three points clear of their neighbouring rivals and possess a goal difference that is 18 better. Fans who travelled from as far afield as Azerbaijan react to the cancellation of Manchester United's final-day match against Bournemouth. "The first indications that all was not well at Old Trafford came when stewards swung into action and fans were evacuated from the Stretford End. "Thousands of supporters were already inside the stadium when, in a well-organised drill, supporters in the giant Sir Alex Ferguson Stand were also moved out as a 'Red Code' operation was announced over the public address system. "Those in the Sir Bobby Charlton Stand, where some had already gathered in the directors' box, and the East Stand, where the Bournemouth supporters were assembled, were told to stay calm and remain in their seats. "Bournemouth's players had started their warm-up but they left the pitch swiftly once it became clear a security operation was under way as police moved in and a helicopter flew above the ground. "Some Bournemouth fans were unhappy at the regular announcements to remain in their seats, especially after word had swept around Old Trafford that the game had been called off, but safety was understandably paramount. "Once the official announcement was made to those still inside the stadium, there was an orderly exit, although roads around the ground remained cordoned off by police and stewards as fans were shepherded away from the area where police were carrying out an inspection of the suspect package."